Photo courtesy Bendheim Wall Systems Inc.
Watertight façades are critical for the longevity and durability of any building, especially in damp, coastal climates. Water, snow, and wind can cause premature failures of building enclosures and multi-layer façade systems—such as rainscreen assemblies—have been proven highly effective in controlling water infiltration into the building. In British Columbia, for example, rainscreen design solutions are required in accordance with article 9.27.2.2 of the British Columbia Building Code (BCBC). This article focuses on the multiple benefits of glass rainscreen wall systems that achieve a watertight, attractive, and easily maintained building envelope. One of the priorities in designing buildings, regardless of their use, is moisture resistance. Not only can moisture infiltration undermine structural integrity and deteriorate exterior surfaces, but it can also foster mould and rot that pose serious health hazards. Holes, gaps, micro-cracks, joints between materials and around openings, and even porous building materials can allow water into the building. capillary action, which includes a combination of the surface tension of water and the adhesive forces between water and building materials with which it comes into contact. For example, capillary action alone can be a major force for water penetration in porous materials, such as masonry. It allows water to penetrate until the material is saturated, despite the beneficial forces of gravity or air pressure differences. Just as a raincoat protects a person from the elements and can add a dose of style, a properly designed rainscreen system can improve esthetics and effectively protect the building envelope from moisture penetration. There are two functional types of architectural rainscreen described in this article: drained and back-ventilated, and pressure-equalized/moderated. 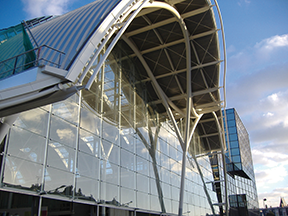 Glass rainscreens have been featured in numerous international projects. 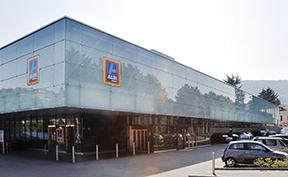 Aldi Suisse supermarket (Chiasso, Switzerland) owes its sleek, modern look to ventilated glass rainscreen system, which consists of horizontally overlapping, tempered, silkscreen-pattern fritted glass panels. Photos courtesy Längle and Bendheim Wall Systems Inc. Both types allow water to escape and air to circulate behind them. In some cases, rainscreens can also provide improved exterior noise protection. The concept of rainscreen design dates back to the Middle Ages, with the earliest examples found in Norwegian churches built using layers of open-joint, drained, back-ventilated wood claddings set over traditional wood or stone walls. Many of these historic structures have survived to this day, including a stave church in Urnes built circa 1130. It is believed to be the oldest standing example of a rainscreen. Gradually, closed joints were adopted on buildings with timber claddings and openings at both the top and bottom of the cladding allowed for drainage and evaporation of any penetrating rainwater. By the 1980s, Canada and Europe took full advantage of rainscreen systems. The concept is gaining popularity elsewhere, with fresh interest throughout the United States. Rainscreen claddings can be made of various materials from aluminum to terra cotta. Glass is one of the top choices due to its inherent durability, ease of maintenance, and resistance to staining and graffiti. A non-porous material, glass is well-positioned to stand up to the punishing effects of water, wind, and time. Yet, another benefit of using glass for rainscreen applications is the ability of transparent or semi-transparent glass panels to preserve daylighting capacity in buildings. The development of contemporary architectural flat glass technology has made virtually limitless decorative options available for use in rainscreens. Coloured and patterned decorative glass varieties are particularly in demand, as they can create dynamic, inspiring environments and noteworthy building façades. Recent safety glass introductions—such as photographic printed interlayers for laminated glass and direct-to-glass printing techniques for fully tempered glass—make such façades the perfect medium for a large-scale expression of architectural creativity. Channel glass, a specialty type of U-shaped glass, can also be used to create seamless all-glass drained and back-ventilated rainscreens, up to 7 m (23 ft) tall, including curves and corners, without the need for intermediary glazing clips or vertical framing. The glass channels are captured in frames at the top and bottom, and are standing off from the performance wall, allowing for air circulation. A channel glass rainscreen can provide the same benefits as a flat glass rainscreen, with its distinct linear esthetic and minimal visible framing as added advantages. 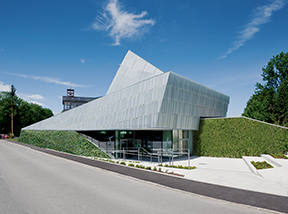 The St. Nazaire Arts Centre in St. Nazaire, France, adds a pop of colour into the surroundings thanks to the interlayer laminated glass panels of the customized ventilated glass rainscreen system. 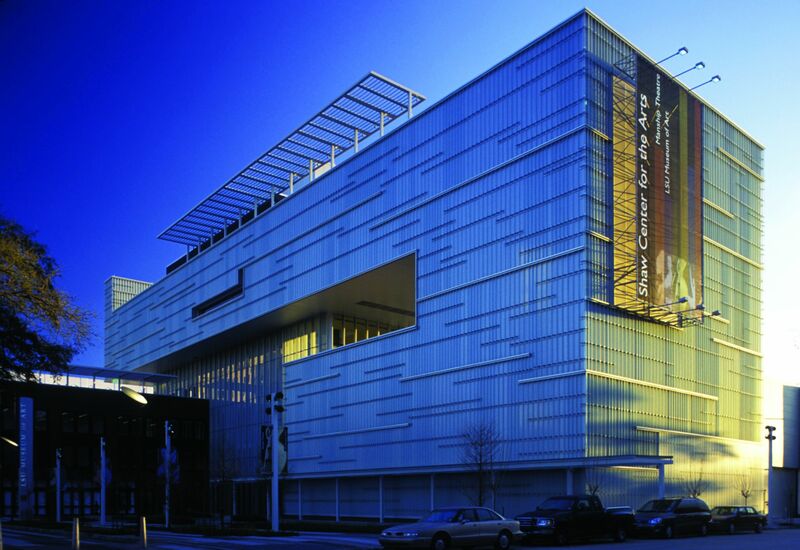 In Baton Rouge, La., the Shaw Center for the Arts represents a distinguished, award-winning example of a channel glass rainscreen installation. Designed by Schwartz/Silver Architects, together with Eskew+Dumez+Ripple Architecture, the facility houses two leading civic institutions: the Louisiana State University Museum of Art and the Manship Theatre. The illuminated channel glass rainscreen protects the building and the works of art it houses, and creates a highly recognizable façade. It has been referred to as the “Lantern on the Levee,” featuring approximately 3500 m2 (38,000 sf) of annealed (i.e. non-safety) and safety tempered channel glass in various sizes. The glass is installed in front of watertight corrugated aluminum wall, using mid-point wind clips and 50-mm (2-in.) open joints between the channels. The resulting luminous, varied texture emulates the shimmering surface of the nearby Mississippi River. The unique flange-outward channel glass design adds visual complexity, as it prevents wind and rain from accessing the metal panels behind the glass by creating a vortex. The glass rainscreen successfully withstood Hurricanes Katrina and Rita without damage. Such assemblies could also be suitable for high-wind, rainy environments like Atlantic Canada. Aiming to control all forces that can drive water into the wall assembly, glass rainscreen systems effectively protect the building by creating a barrier envelope around it. They allow water to escape and air to circulate. Any small amount of water making its way behind the glass is drained and safely channelled away from the building. Water vapour is ventilated through the top of the system, as air circulates upward between the rainscreen cladding and the exterior building wall. weatherproof membranes installed on the building’s exterior surface, behind the glass over-cladding (in combination with fully obscuring/opaque glass varieties). Rif Community Centre (Salzberg, Austria) features a sloped, ventilated glass rainscreen with vertically and horizontally overlapping etched glass panels. Per the American Architectural Manufacturers Association (AAMA), a cladding system needs to be able to manage and drain any water that may find its way behind it in order to be considered a properly drained and back-ventilated rainscreen. Additionally, it must be adequately vented to allow the cavity to dry. AAMA 509-09, Voluntary Test and Classification Method for Drained and Back Ventilated Rainscreen Wall Cladding Systems, is used for these evaluations. Pressure equalization is defined when the lag time between the cavity and cyclic wind pressure does not exceed 0.08 sec. and when the maximum differential between the cavity and cyclic wind pressure does not exceed 50 per cent of the maximum test pressure. AAMA 508-07, Voluntary Test Method and Specification for Pressure Equalized Rainscreen Wall Cladding Systems, is also used. Certain systems can reach performance benchmarks well beyond the AAMA test requirements. Results of as little as 0.02-second lag time and 0.2-per cent pressure differential have been recorded. Pressure equalization prevents moisture ingress and helps the drainage of any moisture that may find its way behind the glass, as it forces it to fall down along the back side of the glass cladding. While these pressure-equalized glass rainscreen assemblies present the most dependable solution for buildings exposed to significant amounts of rain and wind, a drained and back-ventilated rainscreen without pressure equalization can be an appropriate choice for numerous applications. any of the above, designed to achieve partial pressure equalization by compartmentalizing vents at corners, and to the extent it is practical, in the façade. Glass rainscreen assemblies can transform and weatherproof buildings across the entire range of commercial, institutional, industrial, and multi-family residential applications, including low- and high-rises, sports venues, and transportation and parking structures. The train station in Orleans, France, features a glass rainscreen with horizontally overlapping, tempered panels. In addition to ensuring the efficiency of wall assemblies in new construction, glass rainscreen systems present a successful and sustainable rehabilitation solution for aging buildings. The growing number of buildings marked by a dated esthetic and deterioration poses architectural and environmental challenges. Many of today’s buildings were constructed during post-war booms in the 1960s and 1970s, and are reaching 50 to 60 years of age. Their skins comprise materials and construction techniques susceptible to long-term degradation, and have a reasonable life expectancy of up to 30 years. Adaptive reuse of a building, or a group of buildings, can revitalize and uplift an entire neighbourhood. Even though old buildings might leak, look run-down, or waste energy, they present an opportunity to provide essential spaces without incurring costly, time-consuming, disruptive demolitions. 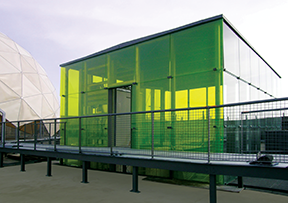 Following the reuse-reduce-recycle paradigm, attractive glass rainscreens can over-clad old buildings and allow for the maximum reclamation of existing structures and resources. Internationally, over-cladding aging high-rises has been a key strategy for carbon reduction, especially in the European Union (EU). A leader in the field has been Germany, where the tower blocks of post-wall Berlin have been significantly upgraded as part of both environmental policy and unification. In Bratislava, Slovakia, the entire district of hundreds of tower blocks is in the process of being over-clad as part of the country’s environmental agreement in joining the EU. The project is not only making buildings more efficient, but also breathing new life into the aging district through new mixed-use and improved public space. At the Zizala Lighting Systems in Weiselburg, Austria, the ventilated glass rainscreen system features compression glass fittings and coloured glass to create an enclosed walkway between two commercial buildings. Flat and channel glasses are often made with significant portions of pre- and post-consumer recycled glass, and metal components may also be made with up to 100 per cent recycled materials—an added benefit for sustainability-oriented professionals. As glass façades grace an increasing number of buildings worldwide, the question of bird safety has gained prominence in the industry. Bird-friendly decorative glass options are now available to help prevent an estimated one billion annual bird collisions with glass façades in North America alone. The American Bird Conservancy, the leading organization advocating for avian-friendly architecture, advises birds avoid windows with vertical stripes spaced approximately 100 mm (4 in.) apart or less, or horizontal stripes spaced 50 mm (2 in.) apart or less. More complicated, dotted, or irregular patterns that follow the general spacing guidelines may also be used. Fully etched, opaque, and textured glass varieties eliminating or significantly reducing reflections are also considered bird-safe. 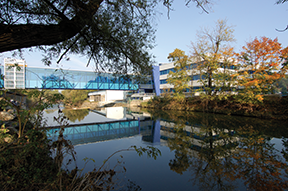 Channel glass can be a bird-friendly façade product due to its signature profile and various textured surfaces. Cities such as Toronto, San Francisco, and Chicago, as well as the state of Minnestoa, have adopted bird-safe building standards, and others are likely to follow. Eliminating or minimizing disruption to normal building operations is a major benefit of the rainscreen, or over-cladding, strategy. Rainscreen installation takes place almost exclusively on the structure’s exterior, avoiding interruption to occupant activities inside the building. This process also provides a unique opportunity to completely transform the building appearance and convert run-down or unsightly structures into attractive architectural landmarks. Glass rainscreen systems have the potential to become a primary means of protection and preservation of buildings, shielding them from the elements, ensuring their structural viability, and helping extend their productive lifespan. They can add elegance to a building façade with an array of decorative architectural glass options, rehabilitate aging buildings, and beautify and elevate neighborhoods. 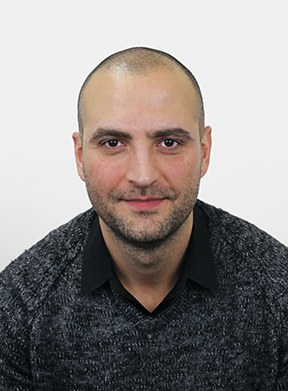 Said Elieh is the head of technical design for Bendheim Wall Systems, and the product manager for its decorative glass rainscreens division. 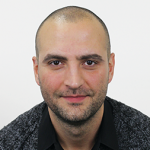 He has more than 15 years of construction industry experience, and holds a master’s of architecture degree. He can be reached via e-mail at selieh@bendheim.com. Excellent and honest post. I found this much useful information, I found your website just right for my needs. Thanks for such post and please keep it up.